Some more stenciling ideas for ya! 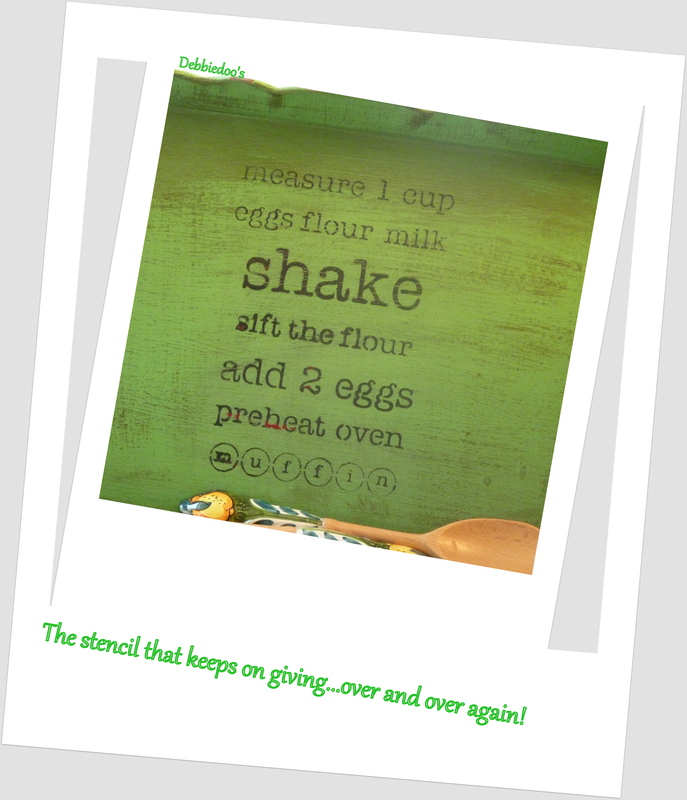 I think I am tossing this recipe stencil right in the can. Not sure how much life is left in it. I have had this tray that I found at Walmart one season marked down to $2.00. This was the original tray in plain red and I stenciled a fleur-de-lis on it. Red is really not my color though. I like it certain times of the year, but NOT all year. Out came my Annie Sloan Antibes green AGAIN! I swear that paint last forever. I really love this color. just to see what else I could slather this paint on. 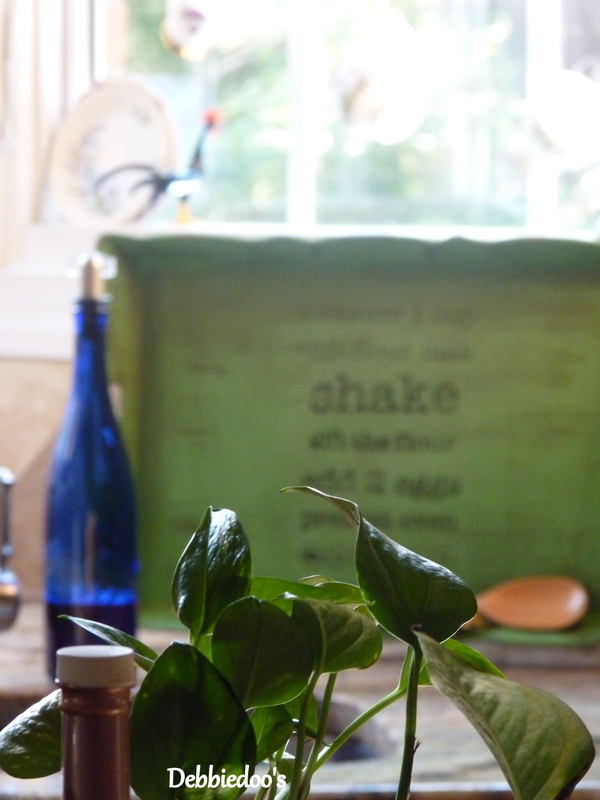 A live plant…yes still alive. Not too many other plants doing well around here. I lightly distressed, so a little red would peek through. Summer is closing in on us fast. This has been the fastest summer I can ever recall gone by. I will be checking in here and there when I can from Buffalo. Pretty soon some Fall fun decorating will be happening! I usually bust out the bins September 1st. Don’t forget about the Richard Gere Pinning Party! Debbie, you scored a deal on that tray! And it looks marvelous in that shade of green. You can’t retire that stencil-it’s too good! Love the tray! It’s so adorable. The dishtowel is perfect as well. Love! I’m thinking of a million things now I could stencil with a recipe. You have inspired me with the towels and now the tray! I love the tray transformation! That is such a great shade of green. Debbie I love that color but have yet to try it. Your tray looks awesome and great shots! I was thinking of you last night, guess what I was watching on AMC?? Nice tray makeover, Debbie! I love the scallops on the tray. 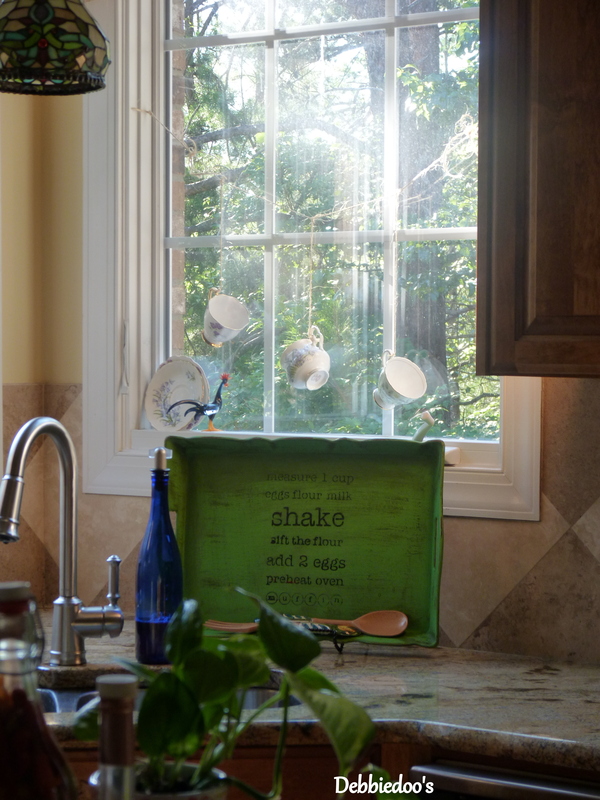 It looks great in your kitchen, too. I have no live plants in my house now. Not since I killed the ivy I bought for my laundry room last month. What a great idea…I love trays and I do have plenty of them…never thought of putting a recipe on it…. now this I like! Looks like I will be giving tray a new look. Thanks for sharing! That’s cute and I love that color, too. You sure got your money’s worth with that stencil. I love the green color, I haven’t seen that one before! I like the green too. I need to get some other colors of paint besides my standard white and gray. Love the tray makeover! Very pretty in green! I can’t believe it’s almost FALL! Hi Donna, the spoon and fork came from Italy. A dear friend brought those back for me. Thank you. You are such a rock star! I love this! You know I am the president of that tray’s fan club 🙂 And your photography…..seriously! It looks amazing! I absolutely adore it! That green is perfect, especially with the red peaking through…love! That tray looks great! I love how it turned out. You cannot get rid of that stencil. That stencil is legendary!! I love the new green color and stencil on that tray! That is such a pretty green too. I like how you darkened it a bit too. Too bad that the stencil is not usable any more. It was a good one! Debbie, that is the cutest, and I LOVE the color!! I also love the bell. It looks like one we have here that is really old. I love the green on your tray….such a pretty color Debbie! I LOVE this tray! I’m telling you right now… this is a copy cat for sure!!!! And that green is so striking! I need to use one of my recipes on a tray! LOVE THIS!!!!! I see that you are sharing this on TUTORIALS TIPS AND TIDBITS… thanks! So cute! I love that shade of green!!!! Be still my heart, officer and a gentleman ….My all time favorite movie!!! The tray is adorable and yes, I would love that stencil…don’t you be throwing it out!! So very pretty. I think I like that green quite a bit. Nice. I love how they tray turned out- the green is wonderful and I love the red paint peeking through! Debbie, One more quick question or two. Thank you for your time. Did you prime? Or sand prior to painting and or use a deglosser since the tray is plastic and so shiny? Been thinking about it this since I saw it yesterday! Love it. TFS. Just tooo cute. I need to learn how to stencil…and find all those cute stencils. I love the green tray! It’s so pretty in its new life! You’re creative and everything can be transformed to make the ambience sound with your mighty hands. Love the vivid green. With fall approaching, looking forward to your inspiring decoration idea. 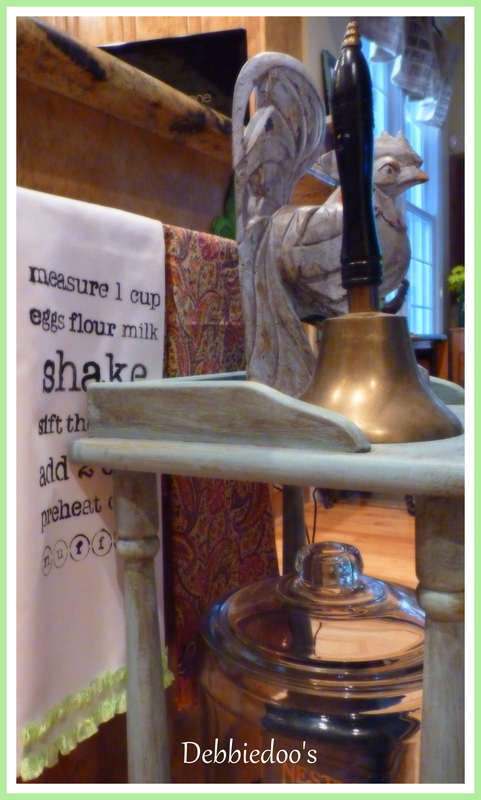 So glad you stopped by TUTORIALS TIPS AND TIDBITS with this darling tray! It is on my to do list!!! This is GREAT! Would make a nice gift to my sister with Granny’s recipe! OK, I just have to go find some of that paint because it’s so great and I seem to be the only person on the planet who has never used it. Great tray makeover! Great job! Love the color too although I don’t have much green here. Still love the dish towel! Love the tray, Debbie! It was actually pretty dressed in red, but the green is soooo……yummy! Hope you have a wonderful and safe Labor Day weekend! I love your tray and that color. That has been a favorite color for me for a while now. It is a happy color. Love the recipe on the tray. Seems I can only think about projects I would like to do.I am really having a hard time with the heat this summer. One hates to wish life away, but it is good summer will soon pass. So cute Debbi! Am waiting for your knock-off party/copycat party. Thought it was usually at the first of the month. I have something fabulous to share!! let me know when you plan to do another! Debbie, I love your tray! What a cute idea! You hit a home run with this remake! It’s so darn cute! I can just see you standing in the middle of your house with that paint brush looking for something to attack! Great job on the tray and I agree that color is fabulous.